No single free hunter fc wanted to work for me, especially the feeding part so I decided to make my own. Ill admit right away I used eeny hunter from vanilla and heavily modified it according to my needs. This will probably work only for TBC version of the game and wrobot due to using wow api tbc version. Feeds your pet (Only if your pet eats Meat! ) Added Fish + Fruit + Bread in 1.1 version Use Aspect of the Cheetah if you are on the move! Revive it Wont spam revive until you at least have the pet Move backwards if target is too close Use rapid fire/arcane etc. I have extensive Feral Experience, Here is a FC I use for leveling after downloading a diff free FC and having lots of issues with it, I have changed about 75% of it to be wayyyy more productive. set it to use food/drink, it will hopefully not have to eat/drink often but still will help. - Arcane shot <- Will only use if Aspect of the Hawk is active to save mana if in viper. 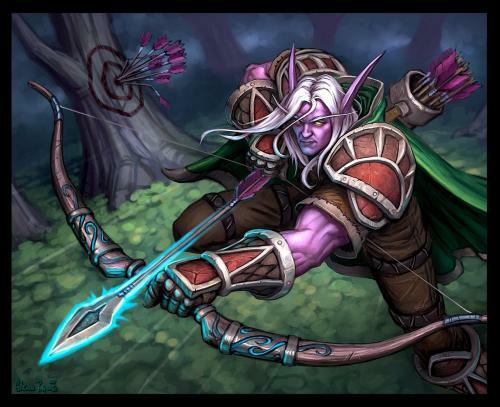 - Arcane Torrent <- Will only be able to use if you are a Blood Elf. Will only use if you are below 25% mana or have many enemies around you. /rotatoggle <- Toggles rota pause on/off. - Please add suggestions on my Discord. Always feel free to send me suggestions or bug reports via PM on WRobot Forum or through my Discord channel! Disclaimer: This fightclass only works with the English client. It is possible, that I will add support for more later. Do NOT use this in arenas. This is not PQR. For questions and bugreports, please reach out to me directly on Discord. The attached file is a simplified demo version. Priest’s are a hard class to look human as. But perhaps you just love healing in arenas and want to gear up in BGs without getting reported AFK. I have used this Fightclass to farm around 180k honor and several different BG marks without ever being reported. Uses spell rotation that are unlikely to make anybody recognize you as a bot This profile uses frame lock. This means it freezes your game for a short amount of time to make sure no spells are skipped and the correct spell in the rotation is always selected. For questions and bugreports, please visit my Discord channel. The attached file is a low-level demo version. If you use this fightclass to level, I recommend getting a Wand asap and activate the Good Wand setting. Use a spec similar to this, where you put the rest of your points is up to you. You don't have to follow this exact spec either, but definitely put at least 8 points in Demonology. The attached file is a low level demo. Warrior are a rocky class to level. This fightclass is designed to have a lot of options to keep you alive. I highly recommend getting a good 2 hander and not switching to 2 weapons until higher levels (if you run Fury). For questions and bugreports, please reach out to me on Discord. The attached file is a simplified demo version. Creates Water/Food, so that you can use it for max level farming in highly contested areas too. It automatically sets your current water/food in general settings. You only need to activate drinking. For questions and bugreports, please reach out to me on Discord. The attached file is a simplified demo (no Cat Form) version. Feral druids aren't an easy class to create a solid rotation for, stances (forms) make it quite complicated. I’m here to help ease your frustration and to optimise the class for mana efficiency and reduced downtime. I highly recommend getting level 10 and Bear Form before using this. Please do remember to re-download the fightclass every time I announce an update! DISCLAIMER: English client only! If you want to use it for another language, change the Spell strings in the file! I made this fight class solely for farming, especially elementals. Combine it with some grinder. It does something for leveling as well, but its pretty obvious that it is a bot if you try to level from 1-62. Automatically applied windfury to weapons. Pulling with Lightning Bolt if the target is far away or unreachable due to the environment. Using Water and Lightning Shield to regenerate Mana. Loots as soon as possible, with a custom loot fix. Heals up if < 50% or below 70% when outfight. StopTabbedAttack, didnt seem to work well with this fight class. I will not update this fight class, feel free to use the source and publish it yourself. It is not allowed to use the fight class, modify it slightly and release it in a paid manner. Mages are not an easy class to automate, let alone look human as. Therefore this took quite a while to come out. It will receive some updates to the kiting mechanisms, but overall I am satisfied with the rotation. I have used this Fightclass to farm around 60k honor and several different BG marks without ever being reported. Disclaimer: Heavily undergeared in this video and getting easily and quickly killed by Alliance dominating all BGs on Warmane. Disclaimer: This fightclass only works with the English client. It is possible, that I will add support for more later. The attached file is a max level Sub Rogue fightclass for farming. - Auto Buffing (1.1.0) <- Smart auto buffing Will check party and do MotW or GotW based on what is smartest. It iwll only do GotW if you have 5 more mats for it in bag. (It will not auto buff group in raids, i can make it do that too if requested). - Lifebloom Mode <- Focus (tank) lifebloom mode, can be changed from MIssing HP to Always. If it's on Always, then the healer will try to keep lifebloom on 3 stacks all the time on focus. - Optional wow addon, which will save your settings, so if you changed your pet food or tuned off some spells. You will not have to set it every time you log on. - Removed "Coming Soon" from Auto Buffing. - Fixed bug that would cast Lifebloom on target instead of focus. - No longer tries to cast spells with casttime while moving. - No longer casts tree form when you are casting something else (mount). - Code cleaned up for more smooth experiance. - Changed so foucs (Tank) is prioritized first now. - Fixed Abolish Poison so it works properly now. - Increased the general speed of the fightclass. ﻿- Hotfix for Lifebloom, people have had issues. So rewrote the code. It can be used for leveling, but it is not recommended. This fightclass will save your settings between sessions, so if you set something example: Turn off Fire Blast Then next time you log on it will have saved that setting! - Mage Armor <- Will use if you are very low on mana and have no mana regen abilities. - Drink Water (Conjured) <- It will drink water when out of combat (this will not be interupted, unless full mana). - Use Mana Emerald <- Will use Mana Emerald if you are missing more mana than it gives. - Evocation <- Smart Evocation will use when mana is needed and only in combat. - Auto Buffing <- Smart auto buffing Will check party and do Arcane Intellect or Brilliance based on what is smartest. It will only do Brilliance if you have 5 or more mats for it in bag. (It will not auto buff group in raids, i can make it do that too if requested). Please do remember to re-download the fightclass often, since I update it daily. Remember to do your totem quests and get a decent two-hander to start with! Someone recently asked me to add all relevant spells for WotLK - so it supports that now as well. made this fighterclass after some trial and error. The main problem i saw with other fighterclass was that they didn't properly use the bubbles to rescue oneself from lethal encounters. Feel free to use and modify it to your pleasure! You can choose what blessing to buff, for yourself, and for party members. You can choose what aura you will use. There is an option for lay on hands @ >12% hp. You can choose between Seal of Command or Seal of Justice. When you choose Seal of Justice (the bot will judge so mobs don't flee in fear), for what it does after that, you can pick 2 options: Option 1 after judgement of justice is on the target, the bot will use seal of command til its dead.. Option 2 is instead of using seal of command, the bot will instead use seal of justice (for stun procs) you cannot use option 1 and 2 at the same time. also if you have a draenei paladin there's an option to cast gift of naaru @50%hp and >25% mana this bot will automatically heal itself with holy light @ 50% to turn on options set them to TRUE! Disclaimer: This fightclass only works with the English client. It is possible, that I will add support for more later. This only works for TBC. Other expansions get a separate product. If you use this fightclass to level, I recommend getting a Wand asap. Priest’s are a hard class to bot, but perhaps your love for the class is overwhelming and you just can’t help yourself. I’m here to help ease your frustration and to optimise the class for mana efficiency and reduced downtime. - 3 different fighting rotations for below 20, below 40 and above 40. - Uses all your spells, including Silence, Fear and Devouring Plague in appropriate situations. - Tries to use as little mana as possible while leveling. The rotation was built with increased uptime in mind. Therefore it Wands whenever’s most beneficial. - Smart in PvP, if used at level 70, including silences, dispels, mass dispel, deathing polymorph, etc. The attached file is a low-level demo version. Ret Palas are a hard class to bot, but perhaps your love for the class is overwhelming and you just can’t help yourself. I’m here to help ease your frustration and to optimise the class for mana efficiency and reduced downtime. Automatically detects if you learn new spells while leveling, no need to restart the bot This profile uses frame lock. This means it freezes your game for a short amount of time to make sure no spells are skipped and the correct spell in the rotation is always selected. Rogues are not an easy class to automate, let alone look human as. Therefore this took a little longer to come out, but I am satisfied with the results. I have used this Fightclass to farm around 150k honor and several different BG marks without ever being reported. You need to have Wound Poison V and Crippling Poison II in yours bags! The attached file is a teaser at my upcoming Frostmage PvP fightclass. I wasn't satisfied with the available Mage fightclasses for farming anymore. They died a lot, didn't use the correct gems, didn't use Evocation or outright stopped, couldn't shatter and often made the incorrect food, too. I have used this Fightclass to farm around 3k gold and am satisfied enough with it, that I can release it to the public now. This fightclass does NOT kite.